Persistence Market Research (PMR) analyzes the Battery Operated Smoke Detector Market in its new publication titled “Battery Operated Smoke Detectors Market Global Industry Analysis 2013 – 2017 and Forecast 2018 – 2026”. This global study on battery operated smoke detector provides data for 2017 along with the forecast for the period 2018 – 2026. The main objective of this global battery operated smoke detector report is to identify the dynamics of the market and provide recent updates and insights that affect the various segments of the global Battery Operated Smoke Detector Market. To provide a better understanding of the Battery Operated Smoke Detector Market, the report also includes the analysis of global drivers, restraints and trends, which influence the current market scenario and will define the future status of the global Battery Operated Smoke Detector Market over the forecast period. PMR’s solution is aligned towards meeting defined objectives, thereby helping clients make informed decisions about the global Battery Operated Smoke Detector Market. The research study offers detailed insights and in-depth research on the Battery Operated Smoke Detector Market on global as well as regional levels. The Battery Operated Smoke Detector Market report covers the important factors driving the growth of the market, untapped opportunities for the manufacturers, trends and developments shaping the dynamics of the market and other insights across various key segments. This report on the Battery Operated Smoke Detector Market covers diverse sections, such as the Executive summary, Analysis and Forecast, Supply Demand Scenario, Competition Assessment and Research Methodology & Assumptions. Battery operated smoke detectors are sensors that detect smoke as a primary indication of fire. They are mainly powered by batteries or hybrid systems of wires and batteries in the global market. The main function of a battery operated smoke detector is to signal the primary fire alarm system in a large building or residential complex. The only difference between a conventional smoke detector and battery operated smoke detector is the power supply in the global market. Smoke detectors in which batteries are used as the sole operator are included in the battery operated smoke detectors category. Battery operated smoke detectors have a lifespan of 5 to 10 years. They become inactive only after the total exhaustion of the battery. These battery operated smoke detectors run on 9V batteries and lithium ion batteries, whereas smoke detectors that are hard-wired to the any electrical system use batteries to provide backup power in case a fire knocks out and are known as semi-wired battery operated smoke detectors. What is the Market Potential for Battery Operated Smoke Detectors? Government bodies are imposing regulations that mandate fire safety equipment such as battery operated smoke detectors to assess hazards at the living and workplace. 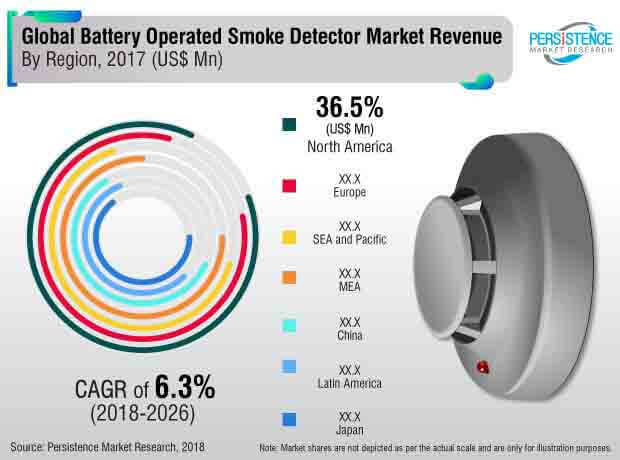 Stringent regulations in conjunction with increasing preference towards providing safety from fire are driving the growth of the global battery operated smoke detectors market. In the battery operated smoke detectors market, manufacturers such Hochiki Corporation, United Technologies Corporation, Johnson Controls, Siemens AG, Honeywell International Inc., Bosch Security and Safety Systems, GENTEX Corporation and Schneider Electric, among others are some of the prominent players. These manufacturers are keenly focused on joint ventures with small-scale players to create a strong customer base across the globe to gain higher market share in the battery operated smoke detectors business. Furthermore, most of the companies are introducing innovative battery operated smoke detectors to sustain in the market as this strategy helps companies grow their business in the battery operated smoke detectors segment in the global market. By introducing new categories of battery operated smoke detectors, businesses can target previously untapped customer markets and gain modest traction in the battery operated smoke detectors market. Some of the market participants identified across the battery operated smoke detectors market include Gentex Corporation, Schneider Electric, Hochiki Corporation, United Technologies Corporation, Honeywell International Inc., Siemens AG, Bosch Security and Safety Systems and Johnson Controls, among others.